Hardwood flooring is a tradition that spans generations, and it remains extremely popular in modern times. Made to endure, hardwood flooring has been proven to have dramatic impact on your space’s appearance. Making small spaces look larger, hardwood flooring represents fine craftsmanship. Today, there are even hardwood flooring options manufactured for installation in spaces where, once upon a time, hardwood wasn’t an option. If properly maintained, your new hardwood floor will last for decades. With its ongoing value and beauty, there’s a lot to love about hardwood. At the same time, hardwood flooring represents a considerable up-front investment, and it simply doesn’t work for every space. If you’re longing for hardwood for your home or office, here are some things you should know before you start shopping. Both engineered and solid hardwood flooring are offered up in a variety of wood species. There are many, many options to consider, based on your space and your personal style. Are you traditional or more on the cutting edge? From the tried-and-true oaks and pines, to the more exotic teaks and mahoganies, there is a hardwood flooring to suit every décor scheme. Solid hardwood is made out of – you guessed it – solid wood. The original form of hardwood flooring, solid hardwood is strong, sturdy, and simple. It has a long lifespan and is offered in many different wood species. Solid hardwood is a good option for those who foresee many renovations in their future, as it can be sanded and refinished time and time again. Engineered hardwood is a modern alternative to solid hardwood. Though it looks similar, it is manufactured in multiple layers. From its clear and durable top coat, to its resilient center, engineered hardwood can take on whatever the day throws at it. It can even go in rooms that fall below grade, since it is made for moisture and humidity. Hardwood is not a one-size-fits-all product, and is available in several different styles to suit your personal taste. There is modern and traditional hardwood flooring, as well as rustic hardwood flooring options that emphasize wood's natural character. The different styles of hardwood are characterized by features such as plank length and width, wood grains, colour, shine, and even texture. Hardwood styles can vary by region, but we have a selection that suits the needs of just about every customer. The best spaces in your home for hardwood include bedrooms, living rooms, and dining rooms. Engineered hardwood offers greater stability and support, but it is recommended that you install hardwood in residential areas with low to moderate foot traffic and little moisture. More durable hardwood options however, can be installed in places like hallways, on stairs, and even in finished basements. And, after installation, hardwood needs to be properly maintained. At Quality Floor Coverings Carpet One Floor & Home, we’re proud to offer all the latest in solid and engineered hardwood flooring products. Our goal is the same as yours: to find flooring that will meet all of your style and functional needs, and will grace your space for many years to come. 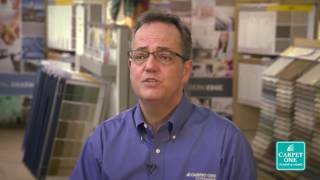 As part of the continent’s largest cooperative of independent flooring stores, we boast the buying power of nearly a thousand other vendors. Visit us today at 4703 50th Avenue in Leduc, AB, and see what hardwood flooring can do for you. There are many things to consider when choosing hardwood, so let our experts help you choose the best option for your home. Once your new floor is in perfect place, we know how important it is to preserve its beauty and extend its lifespan. This need not be complicated: here are a few tips on proper floor care.